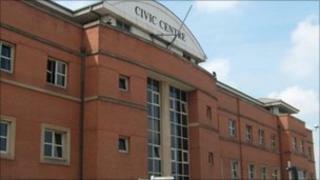 Stoke-on-Trent City Council says its budget cut from the government is "the worst case scenario come true". The authority was told on Monday it would lose £21.6m next year, as councils across England assessed the impact of Whitehall's cuts package. The council was preparing to save £33m in its 2011/12 budget, which includes £11m identified previously. Council leader Mohammed Pervez said the cuts would disastrously affect Stoke which has "high levels of deprivation". The council was told its budget would be cut by about 8.1% next year, as the finer details of the Spending Review were outlined. Staffordshire County Council will lose £10.6m and Cheshire East £4.6m - or about 2% of their budgets next year. Communities Secretary Eric Pickles told the Commons that councils would see their "spending power" reduced by an average 4.4% next year, with no authority facing a decline of more than 8.9% for any of the next three years. Stoke City Council said the £21.6m cut together with £11m it had already identified as "unavoidable budget pressure" meant it had £32.6m less to spend next year. Mr Pervez, leader of the Labour-led coalition, said: "Cuts of this magnitude I believe will disastrously affect Stoke-on-Trent due to our high levels of deprivation, dependence on benefits and public sector jobs." He said the 8.1% cut was despite the council writing to the government asking for Stoke to be treated as a special case because of its deprivation levels. Mr Pervez said: "I am personally overwhelmed by the extremely difficult task ahead in deciding which services we cut. "These cuts will be painful, they will be deep and they will affect some of our most vulnerable people." He added: "We have been preparing for the worst case scenario but it is very sad we have been proven right."